Marijuana Possession Decriminalized In D.C. While Maryland will have its day in October, possession of a small amount of marijuana has officially been decriminalized in Washington D.C. At midnight on Thursday, metropolitan police officers were ordered to keep their handcuffs in their holsters in favor of a citation booklet for all marijuana possession cases less than one ounce. And while there is still uncertainty surrounding the long-term fate of this new law, as it stands today simple possession of pot is punishable by a $25 fine, $50 less than the punishment for littering. D.C. cops have been provided with wallet sized cards for their own reminders, as well as to hand out to the public. The cards provide a general overview of the most important changes that are laid out in the Marijuana Possession Decriminalization Amendment Act of 2014. The five bullet points on the card include a line about the fine and the fact that police may confiscate the marijuana, the requirement of disclosing your name to cops upon being cited (and being subject to arrest if you refuse), the fact that smoking in public and possessing more than an ounce is still a crime, a reminder that driving under the influence of drugs is a crime, and that federal officers may still arrest anyone in the District for possession under federal law. Anyone who has been following the progress of the Maryland marijuana decriminalization law should take a minute to read D.C.’s version on the link above. The D.C. law is easy to read and unlike our state law, it leaves little for interpretation. The District’s law specifically states that possessing drug paraphernalia used in connection with a legal amount of pot is not a crime, thus avoiding the confusion that awaits Maryland. The law also explicitly prohibits police from detaining or searching a person based on the odor or presence of less than one ounce of marijuana. Additionally cops can’t use simple possession as a basis for obtaining a search warrant. The new amendment is comprehensive in that it aims to take possession of less than an ounce completely out of the criminal arena. Not just for the offense itself, but for anything that would have traditionally flowed from it. 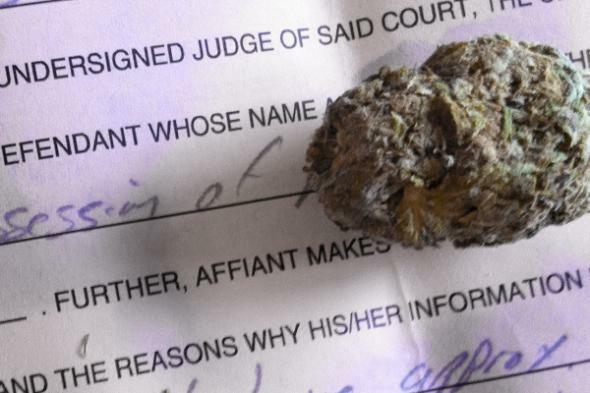 There will be no more searches of a car or a person based solely on small amounts of pot, and judges will not consider this now civil infraction in determining whether to issue a search and seizure warrant. D.C. has also clarified a few issues that police officers traditionally encounter, and this further calls into question just what Maryland lawmakers were (or were not) thinking when they crafted our bare bones law. The D.C. amendment specifically states that it is not a crime to have multiple bags or containers of marijuana as long as the total amount is less than an ounce. We have seen numerous cases where defendants have been charged for felony possession with intent to distribute for having multiple baggies of pot. In many of these cases the defendant possessed a total of less than one ounce. Come October, what will happen if a Maryland cop finds 7 or 8 one-gram bags on a person? You would hope the officer would write a $100 fine and be on his or her way, but things like this should not be left up for interpretation. Short of legalization with taxation and regulation, D.C. got it right, and it remains to be seen whether our state will follow. Benjamin Herbst is a drug crimes attorney who handles all types of marijuana offenses in Maryland, including possession with intent to deliver. Contact Benjamin at any time for a free case consultation.